During a fight the game randomly freezes and the whole PC gets stuck on the last moment screen. I am unable to force-close the application or even change to a different window so I have to sign out or restart the PC to kill it. It just stops with a repetitive gunfire sound in the background. The problem exists since two or three updates but it was extremely rare to write a report. After Monarch's Reign though it happens in 9 out of 10 matches if not in all. Same here. The game freezes and takes the PC with it. But i have to say you guys one thing. You wont get help. Don´t stop reading and judge me now! 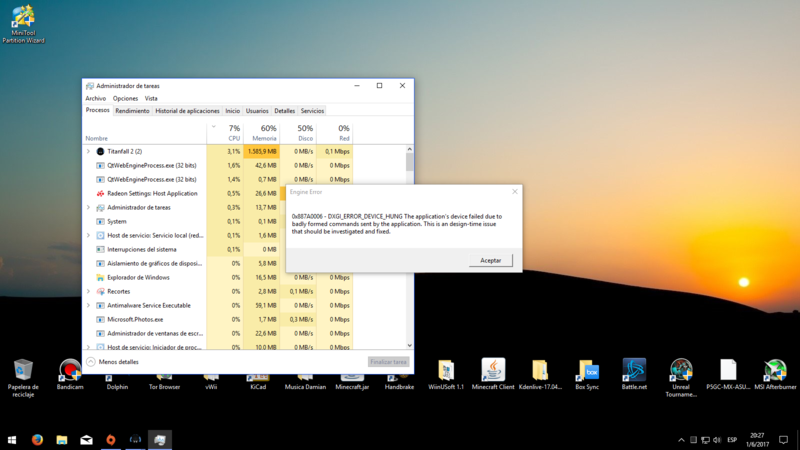 There are lots of threads for this problem, we haven´t got any response for months now.. ..
Well I would be happy if I got an error message, at least I would be able to force close it through the task manager. And yeah I saw the thread. It is a sad situation. I managed to kill TF2 without having to restart everything under Win10 by pressing Windows + X and then going to Windows PowerShell (Admin) and manually killing the process by typing Taskkill /IM titanfall2.exe /F. You might not be able to see the window, but it's still active and registers commands for me. Nvidia Geforce Gtx 960, ever since the colony update i crash whole pc in random times, i havent played this game a whole map through since the colony update.... BUT NO THEY THINK ITS A AMD ISSUE.... IM NOT AMD.... And i have the same phuuuucking issue. Same problem here. It used to just be frontier defense but now it has spread to anything multiplayer. I just want to play this game but I keep running into issues like this. Howdy folks. Just wanted to chime in that this happens to me as well. Tried the trial last week, did the single player flawlessly, then it would hang on the frontier defense usually on round 3, sometimes in the 1st round, and i might have been able to make it to the end maybe 2-3 times. Anyway I figured it was just an issue with the trial and bought it anyway.... still happens. lame. Zero issues single player, crashes after a while in multiplayer with the dx hung issue. Sometimes it just hangs and doesnt give the error. I have updated all drivers and tried a repair from origin. Will keep fiddling with it. I will disconnect the sli and see if that helps. Cant wait to finish my almost first full round, its a fun game lol. Connected with Ethernet cable directly to linksys router. Edit: Tried bumping the settings up to max and disable the crossfire in the radeon settings. The game looks much better and runs smoother now, but as soon as I plopped down a turrent in frontier defense it hung and kept playing music. I could use windows keys to get back to chrome and post this, but the task manager cant even stop the game now. It is running with just 3gb of memory too. Weird. Will keep trying stuff until I get it figured out. try 720p fullscreen with every graphic option set to minimum/disabled. if it still crashes and you're on win10 try switching to another desktop with ctrl+win+D and ctrl+win+left/right. if it works you an open the task manager there and kill it this way. Doesnt work, it wont even let me use task manager or anything else, only thing i can do is restart and press esc if i dont want to reboot. i have to report the same issue since last update. i tried to repair first, then i reinstalled the game, checked the gpu-settings. unfortunately the bug remains. thanks mate for posting it. Anyone else still have this problem? Mine crashed about two days ago again, one at nearly the end of the 1st match and one time at like the 6th match. The game freezes, and all sounds that are playing keep on going in an infinite loop. There is no possibility to return to desktop, most of the times you just need to hard-reboot your PC. I'm now regenerated 7 but going any further just utterly frustrates me because of this bug. I tried running the game in compatibility mode, as well as change all graphic settings to minimum or medium. Played fine for four matches, crashed again afterwards on the second match. This game is really unplayable sometimes. Wish RESPAWN had a fix for this, this is so demotivating. Second crash: No error, game freezes, windows freezes, hard-reset was needed. I have the same problem did they respond? This would confirm the problem is a memory leak which in 2018 the problem still exists and not a users hardware spec problem.